While much could be interpreted from the fliers left on doorsteps in the Missoula and Bitterroot valleys based on comments posted to social media, the Montana Human Rights network sees hostility toward the Jewish community, immigrants and men of color. 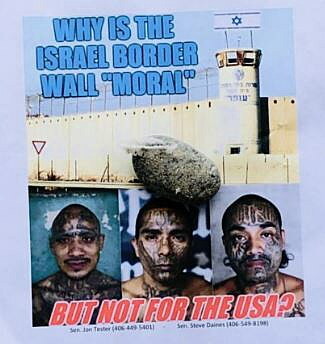 The Missoula Police Department on Wednesday confirmed that it had been notified that fliers depicting three tattooed Hispanic men below a fortified wall and the words “Why is the Israel border wall ‘moral’” had been left on the doorsteps of area homes. Residents in the Lolo area reported the same. The Montana Human Rights Network said it too received reports, and it labeled the fliers as hate material promoting hostility. “This material is a stark reminder that anti-Semitism and xenophobia are collaborators in the current white nationalist agenda,” said Rachel Carroll Rivas, co-director of the Montana Human Right’s Network. Rivas believes the fliers attempt to make a point on the debate over a wall on the southern U.S. border. The wall conjures strong opinions from both sides and has led to the longest government shutdown in American history. But Rivas believes the wall has been used to vilify immigrants, and she blamed the Trump administration for holding the government hostage while refusing to negotiate a solution. One Montana legislator is looking to offer $8 million in state taxpayer money to help fund the wall. The Montana Human Rights Network on Thursday said it would sponsor a sign-on letter in response to the fliers. Comments posted to social media have been sharply divided. Another defended them as free speech. The Missoula Police Department said the fliers alone don’t constitute a hate crime, though their method of distribution has raised concerns. Doorbell surveillance caught a hooded individual dressed in black placing the fliers on private property in the dark hours of early morning. “If we start getting reports or people complaining that they’re coming on their property and depositing these things, we’d try to follow any leads to identify who might be responsible, not so much for the content of the flier, but for the affront that it causes and them going onto property where they’re not necessary invited,” Sgt. Travis Welsh said Wednesday afternoon.